What’s the Optimal Duration for Your Product Video? Though I spend most of my time focusing on video production and encoding, I’m also fascinated by how organizations are actually using video in their day-to-day operations. So when Vidyard released their second annual Video in Business Benchmark Report (freely downloadable here) I had to give it a quick scan. Briefly, Vidyard is a video platform for business, and the company analyzed data from more than 250,000 videos published on their platform to produce the report. Here are the items that caught my eye. Product videos, demos, and explainer videos are the top three, with how-to/educational videos number five. Social media posts are a distant sixth. So most companies are investing in videos that teach viewers about their products, rather than fluffy brand-oriented videos. Ths makes a lot of sense, assuming you’re not a consumer-brand. 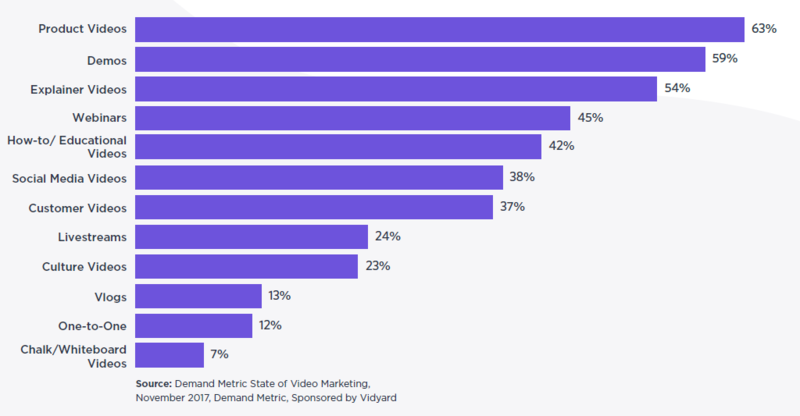 Looking at Vidyard’s excellent customer’s page, most Vidyard customers seem to be B2B companies using video to move their prospects through the sales cycle. If this is you, then the video mix above seems pretty accurate. If you’re a consumer brand, recognize that you may have different needs. 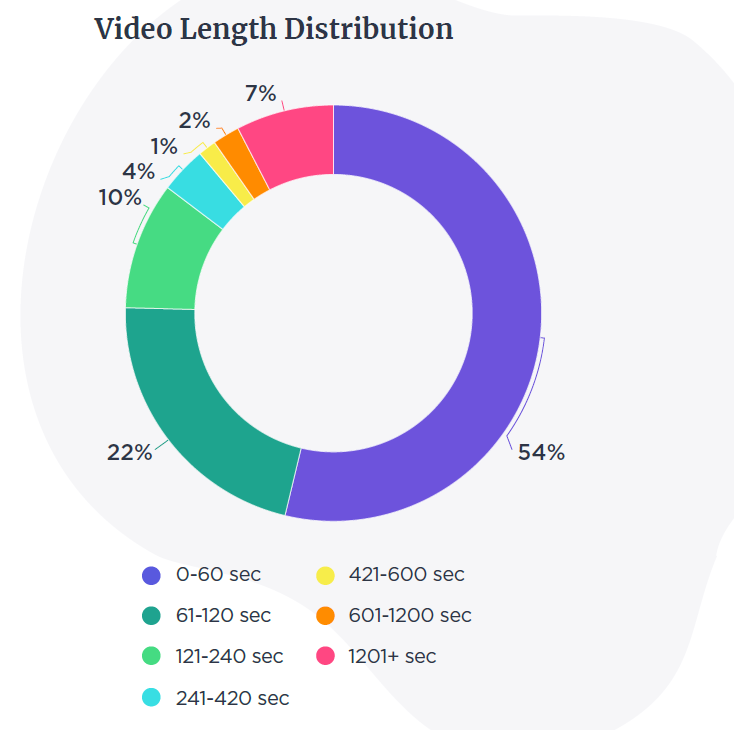 While the average video was about nine minutes long, 75% of videos were less than two minutes. Obviously, those 60-minute webinars are dragging the average higher. I personally think that each video should be exactly as long as it needs to be, but not a second more. I know that sounds fluffy, but the point is to understand exactly what you need the video to accomplish, and as Michelangelo might say, chip away all that’s not essential to that function. Ten years ago, you might see 20-30 seconds of brand-related animations or other eye candy at the start of each video. You don’t need me to tell you that this is a totally bad idea. Speaking of attention spans, the third figure covers that. Specifically, the video shows the percentage of viewers who make it through the first ten percent, fifty percent and to the bitter end grouped by video duration. 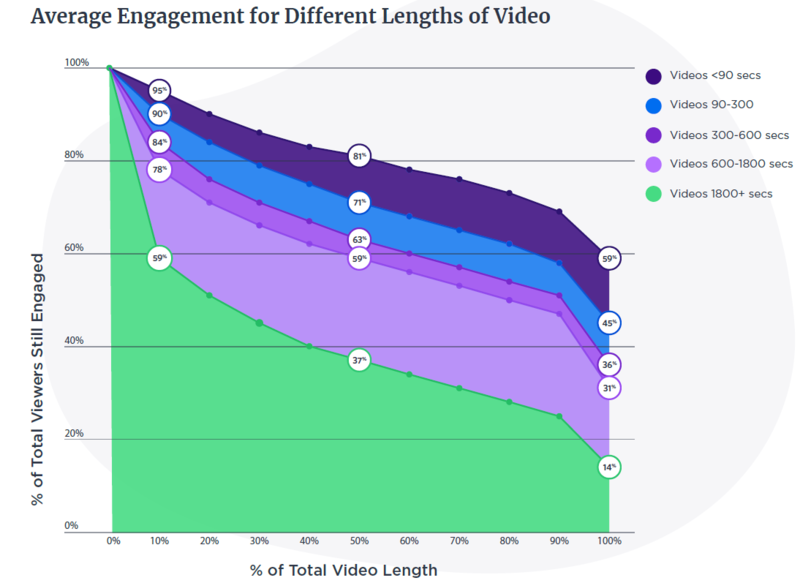 As you would expect, the shorter the video, the better the retention at all stages. Since drop off is inevitable, it’s critical to let the viewer know why they need to watch the video as soon as possible. Interestingly, with their customer testimonial videos, Vidyard uses text headlines on the host page to tell this story (see below). That way, the video itself can follow the typical problem > solution flow used by most customer testimonials. The bottom lines? 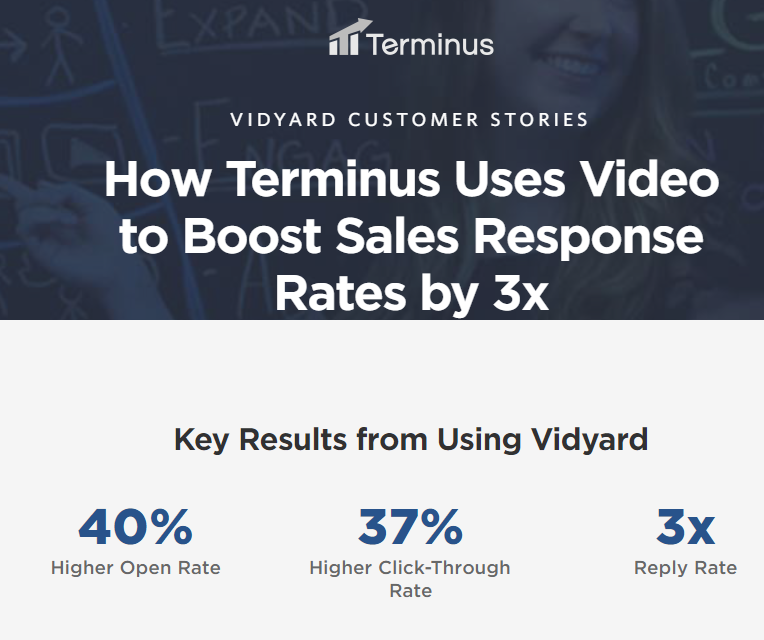 Judging from the investments made by Vidyard’s customers, product-related videos help advance prospects through the sales cycle. Shorter is better, and expect viewer drop off, so make sure to communicate critical messages early in the video or via the launch page. ● The use of video analytics is becoming more prevalent: Those using intermediate or advanced analytics and viewer engagement data to measure performance were 2x as likely to report that returns on their video investments are improving.